To Orph, or not to Orph? 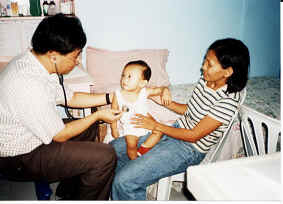 A BABY GETS HIS FREE CHECKUP AT OUR BLC MEDICAL CLINIC. "What if we get the property anyway?" This was the question that Elvie and I were asking each other when land adjacent to the school became available, at a reasonable price. And then Elvie was able to convince the owners to cut even that low price in half. 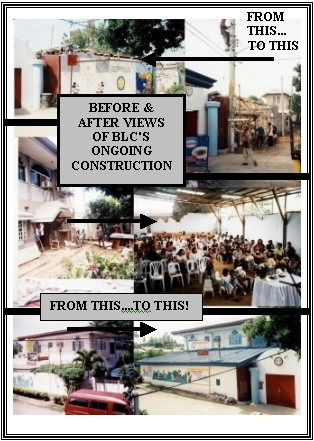 Presently the school is situated on 4 lots, and we have purchased a fifth for the construction of 2nd through 5th grade classrooms. We'll also cut our family's rent in half by living on the ground floor of this new building. We've considered starting an orphanage in the sixth lot, after funds arrive for it. Yet the land might not be available any more by the time we get enough donations to pay the $7,600 we would need to start an orphanage. So upon discussion with our teachers at the school, four are willing to rent the lot from us, in makeshift apartments, to live near the school. In this way we can have the 6th lot now, without any extra expense involved. Even if we do not "orph" (start an orphanage) now, God is setting the scene for when the funds do arrive for this great need. "Sweetheart, the pastor will be upset we're taking away his congregation!" Elvie was concerned that many ladies from Kapalong were coming to Davao to work. "No worry," I said, "He'll be happy that his church people are growing in their faith." The "Kapalong Exodus" began when we found a babysitter for our kids, at less than a dollar a day. After Christmas vacation, she returned from Kapalong with a dozen ladies from her church. Since the husbands have no jobs, they stay home with the kids while the mothers babysit in the city. Here in Laverna Hills, Elvie is their "agent" to find good families for them to work for. All she requires is that they attend our church faithfully every Wed. and Sunday. We'll also start a Bible study/cell group for these ladies. They're Ata tribespeople, the Unreached People Group we're giving horses/bikes to for church planting. The women are being discipled for Jesus here in our church. "Pastor Paul, when do we get our Christmas presents? Next year?" I'd promised the kids in the BLC sponsorship program that, once the money comes in for holiday gifts from their sponsors, that we'd get gifts for all the kids. Challenge is that sponsors give at Christmastime, and then it still takes a few months for the funds to clear. We are so pleased with those who sponsor kids sacrificially, at $20 a month, all year long. And even though it is not required, some send an extra little something for Christmas.